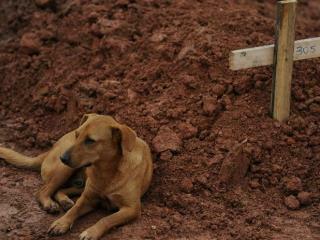 (Newser) – Amid the horrors of Brazil's flooding and mudslides that have claimed more than 630 lives, a loyal mutt's lonely vigil at his owner's grave stands as mute testimony to the nation's hopeless loss and confusion. Leao has been lying next to his owner's hastily made grave at the Teresopolis cemetery since Cristina Maria Cesario Santana was killed in a mudslide. Some 15,000 have been left homeless in the catastrophic rains. New precipitation is now hampering efforts to rescue hundreds still trapped by high waters and mudslides, reports AP. What a touching image. I hope someone looks after him when he finishes his vigil. It is almost like her dog is comforting her owner in the grave and mourning her as well. terribly sad the sight of the dog grieving by his owner's grave. i hope all who can be rescued are, including the animals. hope someone takes this one to another loving home. reminds me of a mausoleum in mt. hope cemetery in roch. ny. the crypt was guarded by his loving dog masterfully sculpted in iron. it was stolen by greedy thieves who probably wanted to profit from the metal or add to their misbegotten collections. disgraceful.